A trendy style for your semi-formal, this two-piece short homecoming dress shimmers with rhinestones and polished metallic lace. You can steal a glimpse of the sweetheart lining through the sheer-illusion mesh on the flirty crop top. Dazzling beaded-lace appliques in a leafy pattern swirl from the front to the back of the bateau-neck bodice. Matching applique defines the natural waistline of the gleaming short satin circle skirt that flatters the figure as it flares away from the hips. 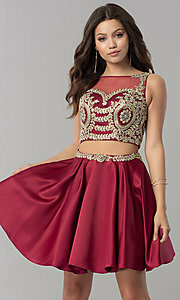 Offered in misses and extended sizes for hoco 2019 or holiday parties, this two-piece short homecoming dress, under $150, is sure to impress your family and friends while remaining affordable. Top 12", Bottom 19", Hollow to Hem 30"